Ryan Sanders retained his New England Fights pro lightweight title with a victory Saturday night in Portland. PORTLAND, Maine — Ryan Sanders of Young’s MMA in Bangor successfully defended his New England Fights pro lightweight championship Saturday night with a second-round stoppage of New Yorker Jacob Bohn in the main event of NEF 36 at the sold-out Aura nightclub. Sanders (18-9) won for the eighth time in his last nine fights over the past two years when the cageside doctor stopped the bout after Sanders landed an elbow that opened a cut on Bohn’s head. Bohn’s record fell to 7-6. NEF also announced that its first fight card of 2019, NEF 37, will be held at 8 p.m. on Feb. 1 at the Cross Insurance Center in Bangor, portending the potential for two shows in the Queen City next year. NEF has come to Bangor in August or September each of the last three years. The upcoming Bangor card will feature a battle for the vacant NEF pro featherweight (145-pound) title between undefeated Josh Harvey (5-0-1) of Young’s MMA and veteran Bill Jones (13-11) of Berwick in the main event. In other NEF 36 bouts, Yorgan De Castro of Fall River, Massachusetts, remained undefeated and became the promotion’s first pro cruiserweight champion with a first-round knockout of South Portland’s Ras Hylton. De Castro is now 3-0, while Hylton fell to 3-2. Matt Probin, a native of Blackpool, England, who now lives in Maine, made a successful NEF debut as he earned a second-round technical knockout via strikes over journeyman Lionel Young. Probin who has fought around the world in numerous combat sports disciplines, including Muay Thai and boxing, is 3-0 in mixed-martial arts competition. Among amateur bouts on the card, Glory Watson of Young’s MMA improved to 2-0 by outlasting Megan Rosado by split decision in one of three women’s fights. Two of Watson’s teammates, B.J. Garceau and Catie Denning, each suffered her first loss in the cage. Garceau (1-1) lost by third-round TKO to Chelsea Tucker (1-3) and Denning was defeated by unanimous decision to undefeated Taylor Thompson (3-0). 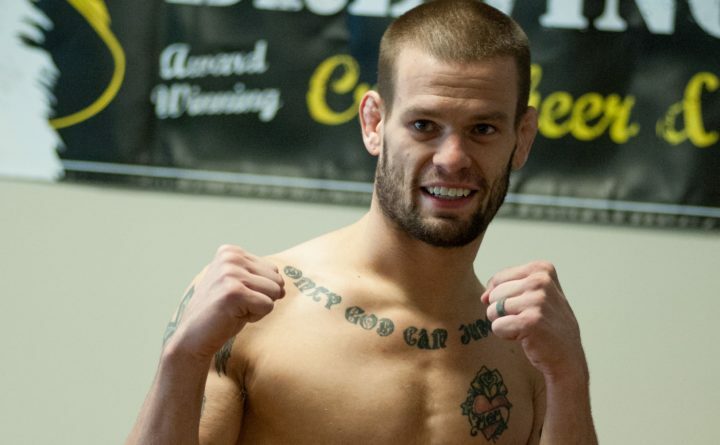 South Berwick’s Devin Powell fell to 1-3 in the Ultimate Fighting Championship after dropping a three-round unanimous decision to Peruvian Jesus Pinedo in a preliminary bout of UFC Fight Night 140 at Buenos Aires, Argentina, on Saturday night. Pinedo, making his UFC debut, successfully countered Powell’s aggressive stand-up style during the lightweight bout and also had the advantage when the fighting went to the mat. Pinedo (16-4-1) won the bout 30-27 on each of the three judges’ scorecards. Powell fell to 9-4 overall.